A rifle boomed. The muzzle blast’s distinct sound bounced through the hardwoods. An unsettling silence produced a multitude of wilderness questions, most centered on a trading post hunter’s survival, in the Year of our Lord, 1794. Minutes crept by, one ridge east of the River Raisin’s frigid headwaters. The air smelled crisp, not damp or storm-like, laced with a faint scent of churned earth from the nest scuffed out behind a hefty white oak. December’s few remaining songbirds kept quiet. Eight crows and three Canada geese winged over, but none uttered a note. After an appropriate passage of time, I got to my feet, stretched, then slung the leather portage collar that bound my bedroll over my shoulders. Buffalo-hide moccasins struck off on a straight course, set on meeting up with the young man who sat over the ridge and down the hill amongst a clump of aromatic red cedar trees. Pausing beside a stout red oak, I realized he was no longer seated, his path littered with upturned leaves. “BOOM!” That shot came from the north end of the nasty thicket, maybe a hundred yards ahead. Again, my moccasins whisked along, keeping high to the hill, avoiding any chance of crossing into a line of fire down in the thicket. “BOOM!” Another shot, this one more muffled than the second, told the story of a deer sequestered deep in the thicket. Thirty or so paces down the trail, I again paused in plain sight, this time in front of an old cedar tree at the edge of a clearing. Wetting dry lips, I imitated the two-note whistle of a contented Bobwhite quail. The young hunter stood in a thick patch of sedge grass, bent forward and peering into the brush. He turned, looked my way and pointed to the south. I signaled for him to stay put and sit. Knowing how visible I was, I retreated into the hardwoods and still-hunted tree-to-tree down to the protection of the trail that followed the thicket’s edge. The young man pursued too soon after the shot, which was understandable. I did not want to make the situation worse, plus the longer I took reaching him, the better. When I came to a doe trail at the edge of a raspberry patch, I slipped into the thicket. Catching the frustrated hunter’s attention, I motioned for him to remain quiet, reach the trail and then come to me. Once face-to-face, his hurried whispers told me the doe could not progress much farther. The main concern turned to improving our position and placing a humane final shot. To that end we circled southeast, hunched over and taking every advantage of the natural cover. The slow advance put us back on the edge trail, behind two oak trees, about twenty-eight paces from the bedded doe. “You’ll have to sho ot her,” my woodland student said, “I lost my patches and I’m not loaded.” He was using a loaner rifle of mine, a reproduction .50-caliber Hawken rifle that shoots right on at seventy-five yards (despite my restrictions that the young man not take a shot over fifty). 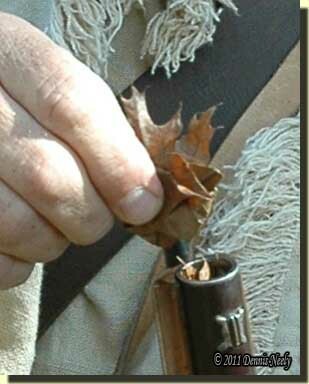 The rifle includes a small powder horn and a shot bag with ample round balls, patches, etc. I never did find his lost patches. “This is your deer. Measure powder and dump it down the bore,” I whispered as I pushed a frosty oak leaf out of the way and retrieved a drier leaf from underneath. I broke the stem from the leaf and rolled it into a wad. A recent email exchange included a traditional hunter’s comment that “You have to patch a rifle ball. That’s just how rifling works.” In a follow up telephone conversation, I retold the above story, noting that the “BOOM!” was closer to a “CRACK!” with the wadding than with the usual greased patch, indicating a greater velocity. I suspect a chronograph would confirm that observation. And true, on that December chase I turned the young man’s Hawken rifle into a smoothbore. The “right on” accuracy at seventy-five yards was in question, and no doubt not achievable. But the shot was twenty-eight paces, and the doe was put down with the same finality as a patched round ball. At the least, re-creating and studying this situation would make for a good wilderness classroom assignment. Another wilderness classroom lesson that seems to be bubbling away in the forefront is the use of animal hide, specifically deerskin, for patching. John Curry’s recent article in Muzzle Blasts addressing deerskin for patching in rifles generated a number of inquiries asking about my opinion on the subject (Muzzle Blasts, June, 2016, NMLRA, Friendship, IN, pgs. 13 – 17). I do not patronize Facebook; let’s just say I don’t agree with their “Terms and Conditions of Use” and leave it at that. But a hunting companion of mine has kept me abreast of other individuals’ social media posts regarding this subject, including those of Mike Beliveau. Anyway, I’m not going to wade into this debate, per se, just as I would hope folks would not offer untested statements on natural wadding in smoothbores. That said, I find the topic of deerskin patching intriguing, and I feel there is value in viewing the learning process from a traditional hunters perspective with the ultimate result of someone who wants to take a deer, for example, using deerskin patching. As so often happens, an “I would be nice to know what they did” question arose in one of these telephone conversations. Without thinking, I reached behind the desk and pulled out a book of Audubon’s essays. I looked over the color-coded sticky notes, flipped open a page with a purple tab and began reading one possible answer to the caller’s query. Over the course of an hour’s conversation, I read aloud from five different authors as specific topics arose regarding primary documentation on the use of rifles by hunters in the backcountry. As long-time readers know, I’m a strong proponent of traditional hunters viewing their 18th-century woodland Eden as a living, breathing wilderness classroom. This notion is not a whimsical or romantic fad that gives lip service to traipsing around the woods in a make-believe haze. Rather, the wilderness classroom is one potential tool at the living historian’s disposal for adding solid, fact-based knowledge and understanding to an authentic portrayal of a flesh-and-blood individual from long ago. For me, the wilderness classroom offers an opportunity to outline a lesson based on a specific question and also provides a structure to go about seeking answers. The process I recommend is similar to the steps of the “scientific method” we learned in high school chemistry or physics classes. First: The wilderness classroom methodology starts by defining a problem or asking a question. The big pitfall with defining the problem is starting with a question that is too broad, which results in too many possible laboratory experiments that produce conflicting or uninterpretable data. Instead of framing a question around using “animal hide,” one needs to be more specific and narrow the field to “brain-tanned deerskin,” for example. The goal is to create a simple, one-sentence question that captures the essence of the issue. And during this first step, it sometimes becomes obvious that what one thinks is a good question is really two or more questions that must be addressed individually. Second: The living historian must do research, seeking out primary sources—actual accounts, artifacts or sketches created by the people living the life—that contribute to a better understanding of the question or add background information. Once in a while the greater part of a question is answered by primary documentation. And on other occasions there is little guidance available in the recollections of our hunter heroes. In the course of an hour, during the telephone conversation where I grabbed source material from my bookcase, we discussed about eight passages that significantly guided our thinking on the subject, and in essence, narrowed and better defined the question of using deerskin patching. Now my intention is not to be critical, but as an outside observer to this debate, no one has put forth any primary documentation on the use of deerskin for patching. The premise that raised the initial question is based on the siege of Fort Harrod in 1777, which appears to be based on primary sources, but what are those sources, where can they be found, and what do they say? Further, should not the point of beginning, at least for comparison sake, be what was used as “standard patching” in that era. From our discussions, one of the key starting points that came to light should be “What was the difference between bore size and the round ball cast by the mold supplied with the rifle?” Again, this is just an observation, but I offer it to emphasize the importance of researching a given question or issue. Third: Based on available research, a hypothesis, or idea of what the answer might be, is formed. Now that hypothesis may be all wrong, or it may be real close to the answer. It is nothing more than a guess as to the answer. And just like defining the question, the hypothesis should be simple and straight forward. It is not uncommon to come up with more than one hypothesis. When this happens the traditional hunter must decide if each hypothesis should be explored or if the question needs to be clarified. There is no right or wrong path at this point. Fourth: Going hand-in-hand with this thought process, establishing the hypothesis allows the traditional woodsman to set up one or more experiments designed to test the validity of that hypothesis. Just as in defining the question, the experiment needs to be “tight” and undertaken in a manner that someone else can duplicate the test and achieve similar results. In this case, significant range time offers the best platform for testing the validity of the hypothesis. One or maybe a series of experiments might be necessary, but it is important that only one variable is changed in the course of one test. On the range, I use a “sighting in target” that is a simple darkened vertical and horizontal axis imposed over a one-inch grid. This target is eight inches square and prints on a standard sheet of computer paper. This size allows for the recording of pertinent information about the test at the bottom. I have eighteen standard items listed, plus room for “other” comments. Again, I establish a process for range time, which includes circling the variable I change from target to target. And I only use one target per variable with a maximum of ten shots per target. I have seen several targets associated with testing deerskin patching, and I find it very confusing when a target shows fifteen or twenty hits that represent three or four variables. Fifth: As the experiments unfold, the traditional hunter must keep accurate data of each test. This sounds more complicated than it is. For range tests, I keep a file folder for each hypothesis. 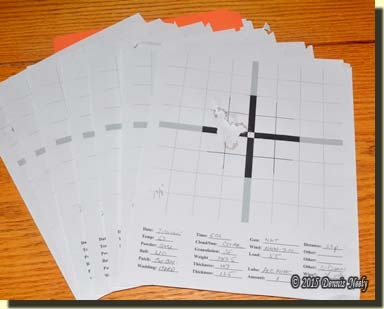 The targets from one session get clipped together. If I shoot at 25 yards, those targets go together; I consider each distance as a “session.” I like to concentrate on shooting when at the range, so I often write out the steps for a given range session, nothing elaborate, just quick notes to jog my memory. I leave the data analysis for a later time, but before the next range visit. I’ve found that even when an experiment is thought to be well-defined, issues crop up. Sometimes those issues require a separate set of tests. If that becomes the case, it is important to think through this change in course so that both the old test data and the new test data are usable. Sixth: Traditional hunters are a solitary lot; few think of “communicating their results.” I can’t begin to count the number of times I’ve sat in on a hunting discussion and heard someone share a tidbit of woodland wisdom or shooting savvy based on years of experience. If you’ve been a traditional hunter for a while, you’ve been in that position. This entry was posted in Deer Hunts, Wilderness Classroom and tagged Black powder hunting, Dennis Neely, historical trekking, Mountain Man, Native captive, North West trade gun, Northwest trade gun, trade gun, traditional black powder, traditional black powder hunting, traditional blackpowder, traditional blackpowder hunting, Traditional Woodsman. Bookmark the permalink.